Orchestrating Regional Innovation Ecosystems is a comprehensive publication documenting the successes, challenges and practices of Finland’s Espoo Innovation Garden. It presents the results of many months of transnational and interdisciplinary teamwork, telling the story of the region’s journey from research to practice, from project to ecosystem, and from ecosystem to innovation. The Helsinki-Uusimaa Region is among the prosperous and growing metropolitan areas in Northern Europe. Within this region, the Espoo Innovation Garden – an open network of residents, companies and communities – is one of Europe’s pioneering regional innovation ecosystems. Editors Pia Lappalainen, Markku Markkula and Hank Kune have brought together 27 articles by more than 40 authors to describe the diverse facets of Espoo Innovation Garden as an orchestrated innovation ecosystem. The Book is divided into five parts: Framing the Regional Innovation Challenge, The Human Perspective on Innovation Ecosystems, Increasing Innovation Capital, Otaniemi in Transition, and Digitalising City Development Processes. In the words of Carlos Moedas, EU Commissioner for Research Science and Innovation: “Regional Innovation Ecosystems – the theme of this book – is one of the key concepts of our time. Societies all around Europe need to get more innovation from research. This requires not just excellent science but also its effective integration with industrial leadership and societal challenges. In an article published in the European Commission’s 2014, Open Innovation 2.0 Yearbook, authors Markku Markkula and Hank Kune review the entrepreneurial discovery process as an active driver of open innovation ecosystems, and specifically consider what is required for orchestrating the ecosystem as a set of emerging parallel processes. 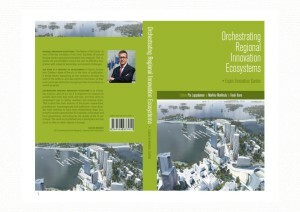 Their arguments are based on the newly published book Orchestrating Regional Innovation Ecosystems: Espoo Innovation Garden, as well as the on-going work of Finland’s Energizing Urban Ecosystems (EUE) research programme. The focus of the article is exploring how orchestration works in practice. They argue that Open Innovation 2.0, entrepreneurial discovery, and societal innovation are key processes in this work, and need to be orchestrated and supported in diverse ways. Traditional management is often organised around meetings, planning sessions and workshops. However, when meetings, workshops and other events are organised without a support structure for follow-through, the capacity for the effective realisation of plans and decisions is limited. Orchestration is needed to take ideas, proposals and decisions much further. Ecosystem thinking impacts how we think about and organise our renewal activities. Markkula and Kune argue that interactive activities like workshops, innovation camps, and conferences are discovery learning processes – not simply events – and should be orchestrated as many parallel interactive processes extending well beyond the duration of the events themselves. In June 2015 two major activities will be organised in Espoo, Finland, together with the Energizing Urban Ecosystems (EUE) research programme, local government authorities and the European Commission: the 8th ACSI societal learning camp and the 3rd EU Open Innovation 2.0 Conference. Both are concrete examples of ‘events’ framed as entrepreneurial discovery processes, created in parallel and supported by an orchestrated follow-through. Both Camp and Conference are positioned as part of a larger innovation process that began in 2013 and is conceptualized as continuing through 2016 and 2017. This article describes the larger context of these events-as-process, and the role entrepreneurial discovery, open innovation ecosystems, orchestration, prototyping and experimenting play in co-creative collaborative innovation. It emphasizes the close integration of Camp and Conference, the interdependence and synergetic working of the diverse concepts, and how open innovation and ecosystem thinking require going beyond ‘events’ to support the realization of good ideas in practice. These are crucial concepts for achieving the mental changes Europe needs to meet the challenges of the 21st century.